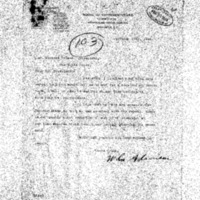 William C. Adamson agrees to meet with Woodrow Wilson at his convenience regarding the Panama Canal tolls. On yesterday I received your kind note saying that you would call me up and fix a time for an interview. I will be glad to see you at any time consistent with your own convenience. I hope that matters are assuming favorable shape so that we can go ahead with the repeal. There is no trouble about reporting it out of my committee at any time when we think conditions justify starting the movement. Adamson, William C., 1854-1929, “William C. Adamson to Woodrow Wilson,” 1914 February 27, WWP18383, First Year Wilson Papers, Woodrow Wilson Presidential Library & Museum, Staunton, Virginia.